Catching Moments represents a beautiful Benetti Classic Trideck 120’ with a brand new cool, contemporary interior. Catching Moments underwent an extensive interior refit in 2016 to include all new light grey wood floors, soft grey and white contemporary furnishings, Carrera marble throughout, and a redesign of the salon banisters and much more. In addition, new all exterior tables, cushions and furniture were added. The Jacuzzi was renewed with beautiful teak surrounding the new raised sun pads. The main salon is equipped with informal seating including 3 comfortable chairs, a couch and coffee table. This deck also includes a convenient service bar and formal dining table. The main deck aft has a beautiful sitting area perfect for lounging, watching the water sports or greeting guests. Her large swim platform is the perfect boarding point for water sports or simply getting on and off via tender or a dock. This area is also perfect for staging for snorkeling, diving or any gear needed from the large tender garage. Catching Moments is the full package for charter, with an extremely experienced crew and well suited to entertaining, relaxing and adventuring around the stunning Bahamas. A cool and contemporary interior includes a grey and white palette with Carrera marble and polished woods and large spaces are complemented by full windows that light up every space. The main saloon serves as the backdrop for charter adventures, with informal lounge seating and coffee tables. This deck is also home to a bar and formal dining table. Accommodation is for 10 guests in five beautifully styled cabins: three doubles and two twins. The large full-beam Master is located on the main deck and includes an opulent marble bathroom, with a bath and shower, and a glass window that looks beyond the bow to the stretching ocean views ahead. The four additional cabins, which include two large VIPs, are located on the lower deck with access via a spiral staircase in the main salon. With the Master and two VIPs, Catching Moments is well suited to charter group of several couples or two families. Above the main deck the sky lounge is a relaxed space, with a wet bar and coffee table, and ideal for enjoying one of the yacht’s large collection of board games or poker set, relaxing in front of a movie, or simply casual gatherings. The sky lounge leads out to the aft deck which has a full al fresco dining table set up – picture warm breezes, a fresh breakfast and a hot coffee served to you on this deck, enjoying views from your own private yacht. Moving upwards to the final deck, the sundeck is the outdoor hub on the yacht, with a dining area for 10, lounge seating, a large Jacuzzi with new padded surrounds for sun bathing. Catching Moments has a large tender garage packed with all the toys and tenders you can imagine including 34’ Jupiter center console towed tender, a 14’ RIB tender, SeaDoo’s, inflatable paddleboards and snorkelling gear. Kids (and grown up kids!) will delight in the inflatable island, perfect for safe and fun water play. The yacht cruises at 11 knots and has stablisers at anchor and underway offering exceptional comfort. 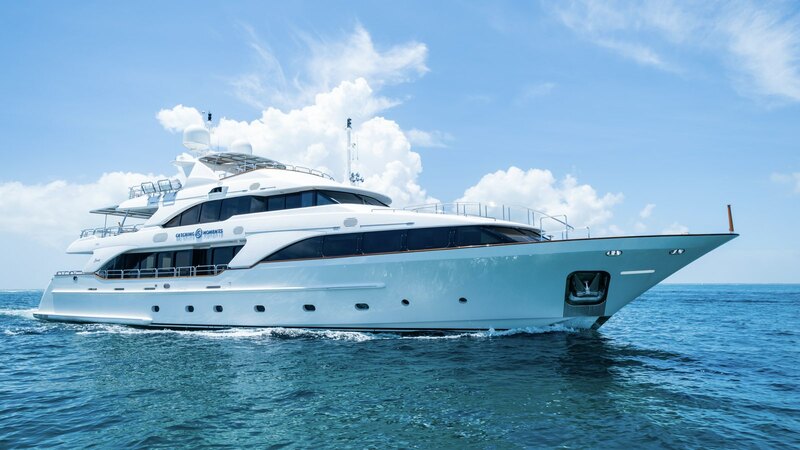 Explore the Bahamas in the relaxed luxury of this beautiful, high-quality yacht, and leave it to the crew of Catching Moments to craft you a custom Bahamas luxury yacht charter vacation that won’t be forgotten.